EQUITY is one of the leading law firms in Ukraine which advises clients (the largest local and international companies) in core practice areas. The firm enjoys a reputation as professional legal practitioners possessing the most challenging legal experience and a deep specialization in the fields of Litigation, Debt Restructuring (Bankruptcy), White-Collar Crimes, Tax Law & Tax Disputes, Banking and Finance, Corporate and M&A. The EQUITY law firm team consists of more than 40 lawyers, including six partners and four counsels. Many of them have been working in the company for over 10 years. EQUITY Lawyers conduct comprehensive support of client projects: from the moment of receiving the task to full implementation of the solutions in favor of the client. In 2017 EQUITY firmly established itself as a leading law firm in such practice areas as Litigation, White-Collar Crimes and Bankruptcy. In particular, EQUITY has become the holder of a prestigious Legal Award — “Best Law Firm in 2016 in Litigation”. We also became finalists (TOP 5 law firms) in the nomination “Best Law Firm in 2016 in Bankruptcy”. EQUITY was included to the TOP-13 leading law firms in Ukraine in 2016 according to the results of annual research TOP-50 Leading Law Firms of Ukraine. 10 of the disputes supervised by EQUITY lawyers, entered the TOP-50 largest litigations in Ukraine in 2015 according to Yuridicheskaya Practika Publishing. 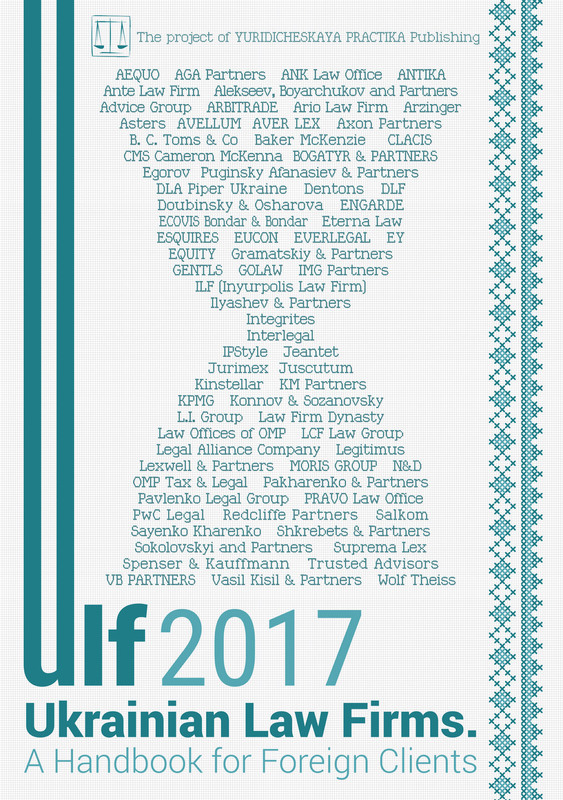 EQUITY was recommended as one of the leading Ukrainian firms in Dispute Resolution, Banking & Finance, Tax, Real Estate and Corporate by Legal 500 EMEA 2017 and was recognized in Litigation and Bankruptcy by Chambers Europe 2017 and in Energy and Infrastructure, Banking and Finance and M&A by IFLR 1000 2017. Among the firm’s clients are the following leading companies: Azovmash, National Bank of Ukraine, Concorde Capital, Knauf, Furshet, AIS Group, Vernum Bank, TrustBank, Ukrainian business group, RwS Bank, Agroholding Mriya, Ferrexpo AG, NEST Corporation, ACME-Color, AutoKraz, Arterium Corp, Terra Bank, Platinum Bank, Zaporizhtransformator, Ukrferry, Deposit Guarantee Fund, Cristalbank, SOTA Cinema Group, etc. Investment in the capital of Ukrainian enterprises has traditionally been considered a risky deal. Obsolete, sometimes controversial corporate law, the generally low legal culture of participants of business relationships coupled with the inefficiency of the judicial system have created a dangerous mixture that has easily undercut the most sophisticated business plans, without guaranteeing investors at least a return of their investment, not to mention expected profits. Litigation in corporate relations has become commonplace, an inherent part of doing business in Ukraine. Imperfect legal means to prevent and resolve corporate conflicts take the leading position in the list of the main reasons for the weak position of Ukraine as a partner in the international capital market. Thus, according to the world rankings of investment attractiveness made by the Hamburg Institute of World Economy International Business Compass, our country occupied 130th position out of 174 countries in 2016, and has become “the biggest loser”, with a fall of 41 positions (89th place in 2015). The decline in confidence in Ukraine has formed several negative trends. The first is that preference is given to foreign jurisdictions with a much richer tradition in the corporate sector (United Kingdom, Cyprus, the Netherlands and others), especially as it relates to a valuable commercial asset, and as a consequence an increase in the share of disputes considered by foreign courts or arbitration courts. It is pertinent to mention a dispute submitted for consideration to the High Court of Justice in London; that is, a multimillion dispute between Ukrainian oligarchs Igor Kolomoisky and Victor Pinchuk about unpaid dividends of a ferroalloy holding, which includes the Nikopol, Zaporizhia and Stakhanov ferroalloy plants, Marganets and Ordzhonikidze GOKs. Another, more frustrating trend is the development with investors of a sustainable reluctance to invest, and often fear of investing, in Ukrainian companies. The current trend is especially notable against the background of demonstration by the domestic economy of signs of recovery. Indeed, despite the low value of assets and the objective prospects for overall economic growth, no investment boom has been observed yet. We believe that the most effective recipe for improving the situation and correcting these negative trends is to conduct systemic legal reforms of the corporate sector aimed at the creation in Ukraine of a corporate environment in which every conscientious investor would feel confident and secure. Given the current pan-national trend of reforming the key areas of social and economic life, and taking into account the politicians’ awareness of the role of investment in the business, the prospect of necessary legislative changes is more than real. Despite the optimism caused by the elaboration of important legislation in certain substantive aspects of corporate relations (e.g., for limited liability and additional liability companies, corporate agreements, etc. ), prevention and resolution of possible legal conflicts still remains a super important and underdone aspect of the reform. Proceeding from the logic of the ancient Roman expression “Si vis pacem, para bellum” ( “If you want peace, prepare for war”), legislators must think ahead of the curve to prevent corporate fraud to the maximum possible extent. For situations where violation of rights of a participant of corporate relations cannot be prevented, legal instruments of court protection become especially important. For the time being the means to protect corporate rights are mainly determined by general rules, in particular Articles 16, 98, 215 of the Civil Code of Ukraine, Article 20 of the Commercial Code of Ukraine. De facto, the first special legislative act regulating instruments of judicial protection of investors was the Law of Ukraine On Amendments to Some Legislative Acts of Ukraine Concerning Protection of Rights of Investors, which came into force on 1 May 2016, and which entered the institution of a derivative claim. That type of claim was positioned in the national law system as a novel way of protecting the rights of a minority shareholder, whereby a legal entity filed a court claim against officials of such an entity for damages caused by unlawful actions of officials of the legal entity. Thus, there were expectations of establishing, through a court procedure, the right of minority shareholders to influence management of the legal entity, while protecting both their rights as shareholders and the rights of the legal entity. However, although the legislator tried hard to promote this way to protect rights, in practice it has not found sufficient demand as only 13 derivative claims were filed throughout Ukraine since the time of the law coming into force (which is more than 11 calendar months). By comparison, the total number of corporate disputes brought before the Commercial Court of Kyiv in 2016 amounted to 274 cases, and only 3 of them — upon derivative claims. This unpopularity of the derivative court action can be explained by its narrow spectrum of action, and ultimately — by its inefficiency. Indeed, collection of money from a director in favor of the enterprise cannot be considered an adequate satisfaction to the person injured in a corporate conflict, who will remain outside the management of the company. Neither can a derivative court action provide protection to issues that are more important for a minority shareholder, in particular, access to dividends, contesting the validity of company contracts that contradict the interests of the company and, accordingly, minority members (shareholders), and others. If the question of the invalidity of the contracts of a debtor is more or less settled by unstable court practice of application of Article 215 of the Civil Code of Ukraine, which allows for qualification of a minority member as “… another person concerned”, who has the right to contest the validity of a juridical act made by the company, the situation with the protection of the right to receive dividends is much worse. After all, the court practice, applying a formal approach, follows the path of “no decision of the meeting — no dividend”, thereby depriving a member (shareholder) of not only a fundamental right to get profit, but also of the possibility to enforce the right (Paragraph 3.1. of the Regulation SECU Plenum On Certain Issues of Resolving Disputes Arising from Corporate Relations No. 4 of 25 February 2016). 1) recovery of damages caused to the member (shareholder) of the company as a result of illegal actions or omission of the company or its member (shareholder). This mechanism will be particularly relevant in cases where the company unlawfully and by abuse, often with the participation of one of the members (shareholders), avoids the distribution of profits and payment of dividends. 2) contest the validity of contracts made by the company with a third person and which violate the law, interests of the company or rights of the member. 3) obtain information, in the scope necessary for the timely prevention and effective protection of violated rights. In preventing possible abuse on the part of the plaintiffs, the above-mentioned rights should only be given to members (shareholders) who possess a significant holding in the capital of the company — a share of at least 10% of its capital. A corporate dispute is a dispute between shareholders (members), in fact, owners of an enterprise, which consists of a number of diverse categories of disputes: a dispute about ownership of a share, setting aside a decision of the general meeting, invalidity of agreements made to the detriment of the interests of a shareholder, etc. However, at the legislative level the notion of a corporate dispute is narrowed, including that artificially by court practice formed over a considerable time. Ignoring the specifics of corporate disputes and their complexity leads to ineffective protection of the rights and interests of shareholders and, therefore, impossibility of real legal protection of such rights. — recognition of constitutional documents as invalid and termination of a legal entity. However, consideration of such disputes in accordance with current legislation should be carried out in compliance with the rules (depending on the category of a dispute) of economic, civil, and administrative jurisdiction. Thus, corporate disputes in Ukraine are almost always accompanied by a set of trials in all jurisdictions. In our opinion, not referring disputes about ownership of shares (share of holding) to corporate disputes is a serious mistake, since any dispute upon the results of which a member (shareholder) of the company is deprived of corporate interest, is primarily of a corporate nature. We hope that with the improvement in the legal regulation of corporate areas the complexity of corporate disputes as one of the main features of such disputes has to be taken into account. We believe that the concentration of all aspects of the contentious relationships of the parties within the same proceedings will enable us to protect the participants of corporate relations more effectively and efficiently.